After trying various Garmont and Scarpa tele boots I found Crispi, an Italian brand that fits my feet perfectly: wide and high volume. I ordered the XP’s as they were described to have the broadest versatility, especially for a relatively new telemark skier. Medium weight to help punch through any crud snow and plenty stiff for tight response. 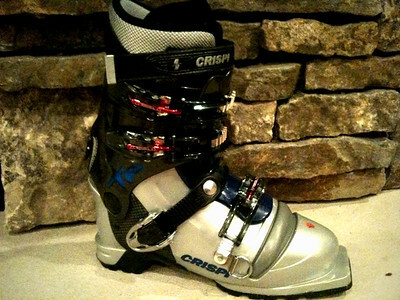 These boots have served me well in all conditions from crusey groomers to earning turns in the backcountry. Most importantly they are very comfortable and my feet are totally secure in them. My heel stays in place and I’ve never had any issues of rubbing, blistering or cramping. I skied on them for a full season before I baked the thermal liners. After molding the liners to my feet I found a whole new level of comfort and control. The boots are also plenty warm which is very important when on a backcountry lunch break between climbs and runs sitting around in the snow. I have yet to take these boots on a multi-day tour to see what it’s like to put them on after sitting out overnight in the cold, but hopefully that will come soon. The Crispi XP’s soft rubber Skywalk sole grips the snow well when walking around on compact snow and the duckbill is strong and stiff enough to punch enough of a lip to step on when booting it up sections too steep to make it worth while to skin up. My few concerns stem from how easily the tongue under each of the upper buckles sometimes mesh the wrong way. I usually catch this when it becomes ridiculously difficult to lock the buckle down and after catching this the first time I know to keep an eye out for this. Also, the power strap is way too long. It makes me wonder how fat of a leg it can accommodate. Maybe it’s that long to work as a shoulder strap when strapping the boots together to carry them, but I’m not sure as I have a boot bag for them. Another little annoyance is having to flip up the D-ring where the leash attaches. I don’t really have a well thought out solution in mind, but if the D-ring could somehow stick out some and not just rest right up against the boot, it would make it easier to attach the ski leash. Continue reading: click “Full Story” below. 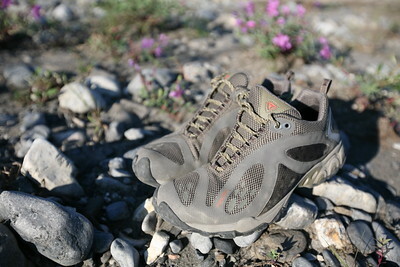 The TrekSta Evolution is a really great all-round shoe. Putting them on and experiencing the NestFIT insole for the first time was a unique experience. The textured insole felt odd at first, but once my foot was in the shoe and settled the tri-density footbed and well-researched last wrapped around my foot and felt very secure.